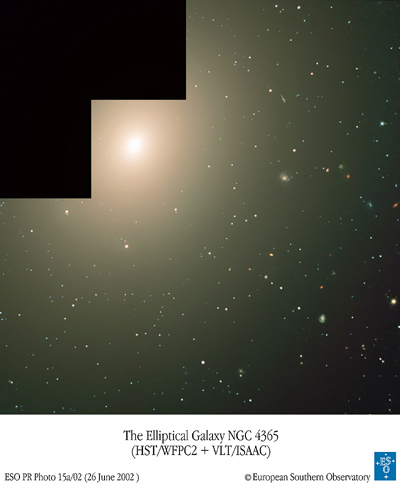 Do elliptical galaxies only contain old stars? One of the challenges of modern astronomy is to understand how galaxies, those large systems of stars, gas and dust, form and evolve. In this connection, a central question has always been to learn when most of the stars in the Universe formed. Did this happen at a very early stage, within a few billion years after the Big Bang? Or were a significant number of the stars we now observe formed much more recently? Spectacular collisions between galaxies take place all the time, triggering the formation of thousands or even millions of stars, cf. ESO PR Photo 29b/99 of the dramatic encounter between NGC 6872 and IC 4970. However, when looking at the Universe as a whole, most of its stars are found in large elliptical galaxies (this refers to their form) whose overall appearance has so far led us to believe that they, and their stars as well, are very old, indeed among the oldest objects in the Universe. These elliptical galaxies do shine with the diffuse, reddish glow normally associated with stars that are many billions of years old. However, what is really the underlying mix of stars that produces this elderly appearance? Could perhaps a significant number of much younger stars be "hiding" among the older ones? Whatever the case, this question must obviously be looked into, before it is possible to claim understanding of the evolution of these old galaxies. It is a very challenging investigation and it is only now that new and more detailed observations with the world's premier telescopes have been obtained that cast more light on this central question and thus on the true behaviour of some of the major building blocks of the Universe. Cosmic archaeology: In order to identify the constitutents of the stellar "cocktail" in elliptical galaxies, a team of European and American astronomers  observed massive stellar clusters in and around several nearby galaxies. These clusters, referred to as "globular" because of their shape, are present in large numbers around most galaxies and together they form a kind of "skeleton" within their host galaxies. These "bones" receive an imprint for every episode of star formation they undergo. Thus, by reading the ages of the globular clusters in a galaxy, it is possible to identify the past epoch(s) of active star formation in that galaxy. This is like digging into the ruins of an ancient archaeological city site and to find those layers and establish those times when the city underwent bursts of building activity. In this way, by the study of the distribution and ages of the globular clusters in an elliptical galaxy, astronomers can reveal when many of its stars were formed. PR Photo 15a/02 shows a colour composite of the elliptical galaxy NGC 4365, prepared from two exposures with the HST and one from the VLT. Many of the objects seen are stellar clusters in this galaxy. There are also a large number of background galaxies in the field. PR Photo 15c/02 shows the distribution of three populations of stellar clusters mentioned in the text (a: old and metal-poor; b: old and metal-rich; c: young and metal-rich). The team combined images in visual light of a number of galaxies from Hubble's Wide Field and Planetary Camera 2 (WFPC2) with infrared images obtained with the multi-mode ISAAC instrument on the 8.2-m VLT ANTU telescope at the ESO Paranal Observatory (Chile). When measuring very accurately the colours of the globular clusters in one of these galaxies, NGC 4365 that is a member of the large Virgo Cluster of galaxies, they discovered to their great surprise that many of these clusters are only a few billion years old, i.e. much younger than the age of most other stars in that galaxy, roughly 12 billion years. In fact, the astronomers were able to identify three major groups of globular clusters in NGC 4365. First, there is an old population of clusters of metal-poor stars, then there are some clusters of old, but metal-rich stars and now, seen for the first time, a third population of clusters with young and metal-rich stars. "We needed the combination of the Hubble and the VLT with the latest space- and ground-based astronomical technology to break this new ground", says group leader Markus Kissler-Patig from the European Southern Observatory Headquarters in Garching (Germany). "Once we had found those young clusters, we then went on to observe them spectroscopically with another of the world's giant telescopes, the 10-m Keck on Hawaii - and this fully confirmed our results." A new important clue to the evolution of the Universe: This is a surprising discovery since the stars in giant elliptical galaxies were until now believed to have formed exclusively early on in the history of the Universe. However, it is now clear that some of the old galaxies may have been hiding their true nature and have indeed experienced much more recent periods of major star formation. This is priceless new information for the current attempts to understand the early history of galaxies and the general theory of star formation in the Universe.